Divers United is a five STAR DIVE RESORT owned and managed by a British family, Alun, Moyra and their son Gwyn Evans (AKA 'G') and has experienced PADI professionals to conduct a wide range of PADI Courses. The Courses take place in Sharm El Sheikh, Red Sea and are run with small classes so that each student gets the attention they need from the instructor. The Prices for the courses below, are based on paying and booking with Elite Diving in the UK. ​Full equipment is supplied for all courses free of charge apart from Divemaster. You will need to buy a relevant PADI course manual for each course, ranging from £30 to £40 each unless you have enrolled on an e.Learning course where your manual will be retrievable on line and updated perpetually. 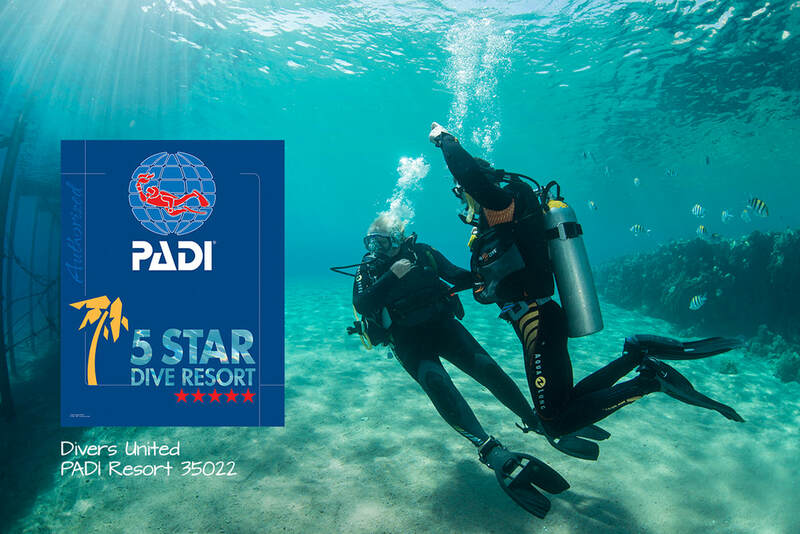 You will also need a PADI certificate which you buy at resort when completing your course with Divers United for 40 euro (approx £37). This course provides the perfect introduction to scuba diving and can be credited towards PADI Scuba Diver or Open Water Diver certification.. If you have never dived before, come along and give it a go in The Red Sea. We have several short courses that are ideal for those wishing to get a feel for diving. We have options available from complete beginner in our pool to shore diving or boat dives with our qualified instructors. To book a Dive course please use the form below. ​Ideal for those who want to begin their initial diver training without committing themselves fully to the five day Open Water Course. The course covers the fundamental elements of diving and basic standard safety rules. After completing the Scuba Diver course you will be able to dive most places in the world to a maximum depth of 12 metres accompanied at all times by a Divemaster or Instructor. The course itself consists of three knowledge development sessions, three confined water or pool training sessions and two open water dives either from a boat or the shore, conducted to a depth of 12 metres. Following successful completion of this course, students can be certified as PADI Scuba Divers. Price includes all dive equipment and tuition. PADI log book is £20.00 PADI Registration & certificate is £40 and is not included and are purchased upon completion of your course. Upon successful completion of the Scuba Diver course it is possible to upgrade to the full PADI Open Water Diver qualification. You may elect to do this in the resort and it adds a further two days to the duration, with two knowledge development sessions, two pool sessions and another two open water dives to a depth of 18m. After completing the extra sessions you will be qualified for a PADI Open Water Licence. This qualifies you to dive to a maximum depth of 18m accompanied by any other qualified diver. ​To book a Dive course please use the form below. All aspects of this course are completed at resort. Your instructors will assume you have no advance knowledge of diving and they will take you through each stage point by point, mixing theory and practice and explaining all the details as you go. It is a complete, carefully structured course designed to teach you to be a safe, competent diver. The course is divided into three parts: classroom, confined water and four open water scuba dives. During the course you will practise and master the skills that you will need as a diver, with your instructor devoting maximum time to teaching you fun, safe diving. This ensures virtually anyone in good health who is reasonably fit and comfortable in the water can learn to Scuba Dive. Your course starts today with an introductory video and the fitting of your equipment. During your first three days a small part of your time will be spent in the classroom for academic training and your water skills training dives will be in the confined shallows of a local beach or swimming pool. After two to three days training you will be ready for your first open water dives. Depending on weather conditions, you will usually go by boat to a suitable sheltered dive site where you will complete your course with four open water dives. These may be made from the beach if conditions are not suitable for boat diving. On successful completion of the course you will be qualified for a PADI Open Water Diver Licence. ​PADI have developed an on line tutorial for the Open Water Course theory. You can study and qualify for the theory section on line before coming to resort, reducing the time you’ll need to spend in the classroom when you’re on holiday. For developing this tutorial, giving you more time to actually dive when you’re at resort PADI charge 190 US$ (approx £123) plus relevant taxes per person enrolling on this scheme. Discount: Buying the On line theory through our dive center the price will be reduced to 160 US$ (approx £110) tax included. Complete all the classroom work on line with e.Learning at home before you set off. The practical water skills part of the course, is completed in the resort and is programmed for just three days. For the most part, diving is a practical skill and nothing can replace practice in the water, but many people value the chance to prepare for the course in advance. The Express Diver programe allows you to work through the theory lessons in the comfort of your own home and at your own speed. You need to dedicate approx eight to ten hours study time to complete the full theory section and produce a theory certificate at the end. You can plan it over a period of time e.g two hour per day over several days. After enrolling on line, PADI's eLearning system presents you with interactive presentations that include videos, audio, graphics and reading. Short quizzes let you gauge your progress, and review and correct anything you might happen to miss. This lets you move through the program efficiently and at your own pace. You need to purchase the PADI Open Water Diver Course online or through our office. It is non-refundable. The fee covers your knowledge development training and gives you unlimited access to a digital version of the PADI Open Water Diver Manual (course textbook). Your PADI Dive Center or Resort will charge an additional fee for the in water practical portion of your certification. The e.Learning course will be available for one year from the time of course registration. At the end of this program, you can print off a certificate to give to your PADI instructor or dive centre. One of the benefits of this program is that you’ll always have access to an updated on line Open Water Manual. The Express Diver Course: When you arrive at your resort, your instructors will first test your understanding of the theory section, then move on to the practical skills. When the practical sessions and dives are completed, you will then become a qualified Open Water diver in just three days. This course is for students that do not want to spend their holiday in a class room but still want the instruction from a qualified instructor to lead them through the initial learning process. A referral course is when a student would have completed their confined water and theory training with another instructor. Then that instructor can refer the student on to another instructor to complete the four open water dives portion of the course. Receiving instructors can pick up the course at any stage within a twelve month period, as long as the student has the documentation from the referring instructor. This course is designed for divers who have completed the Open Water course or any other entry-level dive course. The course focuses on expanding your diving experience and building on your knowledge from the open water course. The course consists of 5 elective dives over two days (two core and three electives) and will introduce you to diving using navigation techniques or in a current and how to plan dives when you want to venture a bit deeper. ​A recognised First Aid course that covers 1st and secondery level first aid. ​The PADI Rescue Diver course develops your knowledge and skills so that you can effectively perform diver assists and rescues, manage diving accident situations and render first aid. The programme is an important step in expanding your knowledge and experience as a diver. The course takes place over 3 days. Days 1 and 2 are spent covering 5 academic topics together with 10 confirmed water exercises. The final day is conducted in a real world environment from one of the dive boats, where you combine all the skills and knowledge gained into two simulated dive accident scenarios. Minimum of Two weeks but four weeks is recommended to begin to gain true experience. As the first level of professional qualification, the Divemaster course will qualify you to organise and conduct diving activities. You will develop your water skills and academic knowledge including dive planning, control and supervision of students and dive management. You will be required to complete many exercises including 15 minute tread water, diver rescue assessment and underwater map making. This qualification is normally required to work as a Dive Guide. You will need to have your own personal copy of relevant PADI manual for each course . These range from £30 to £40. These can be bought at resort through our dive centre at resort or you can buy them before you travel and have them delivered to your home address. Alternatively you can enroll on the e'Learning theory course where you can complete your theory before coming to resort, giving you more time to practice the practical elements. This system will have the course manual on line and perpetually updated. You will also on successful completion of any course, need to purchase a PADI Positive Identification Certificate (PIC card) from resort. The price of this is 40€. Use this form to send us an enquiry message regarding PADI Courses.